This is the northernmost point and final destination for our bike ride. This quiet lagoon is home to Corio Bay Sailing Club and Limeburner’s Lagoon Boat Club. There are also several boat ramps, which are popular with fishermen and other recreational boating. Click an image to see the photographs and animation. The lagoon is a haven for waterbirds. Click an image to view a slide show of some of the birds which live around Limeburner’s Lagoon. If you wish to cycle on to Point Lillias, which is the actual point which marks the northern end of Corio Bay, you will need to continue on the bike path to Lara, then take Avalon Beach Road to the fishing hamlet of Avalon. 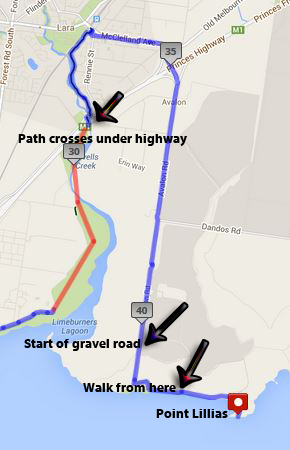 The last kilometre is unsealed gravel road. From Avalon head north, on a footpath at the end of the road. A walk of around a kilometre brings you to Point Lillias. If you would like more information about cycling around Corio Bay, view From Virtual to Reality. Click the cyclist to take you back to the home page.